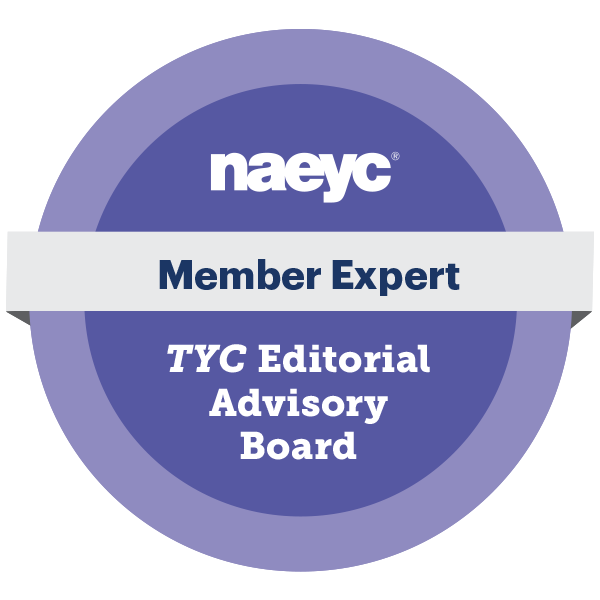 In my experience as an Additional Qualifications instructor, one of the most commonly asked questions is how to find a balance in FDK between teacher guided and child-led activities. 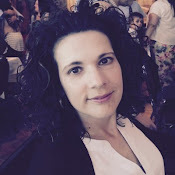 In an emergent program is it okay for the teacher to take the lead and initiate activities? Do whole group times always have to revolve around the children's interests or is it okay to veer in a new direction? 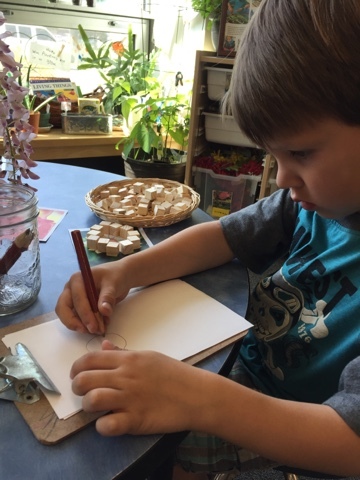 How do adult created invitations for learning transition into child-centred explorations? What does this look like in a real classroom? 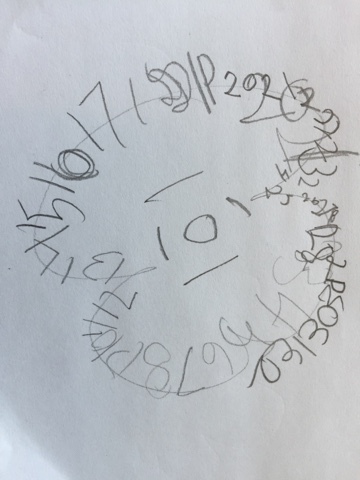 Today I set up a beautiful math invitation for children drawn from the text Reggio-Inspired Mathematics (Novakowski, 2015). From our recent experiences discussing nature in our yard in our Beautiful Tree Project I know that our children gravitate to interesting living things. 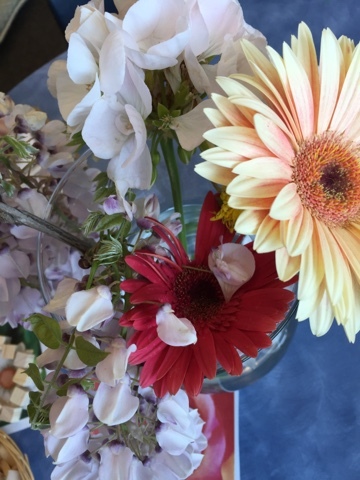 This weekend I did some gardening at my home and picked some of the most interesting flowers I had. I wanted to engage the children as soon as they walked into the classroom in the morning. Not only were the colours vivid, the smell from the combination of flowers could be noticed throughout the room. Each flower had a velvety soft feel and the variety of shapes and textures was interesting to look at. This collection appealed to the children's many senses and was irresistible upon entry into our room. Along with the vase I placed many varied, colourful close up photos of other kinds of flowers not displayed in the vase, writing materials (small child-sized clipboards are always more fun to use and easier for the children to handle on an already cozy table), and small wooden blocks. During our first play block the children had open investigation of the invitation. Some smelled the flowers and moved on, others sketched the arrangement, some played with only the wooden blocks. During our opening circle I brought the materials to the carpet and invited the children to discuss them. 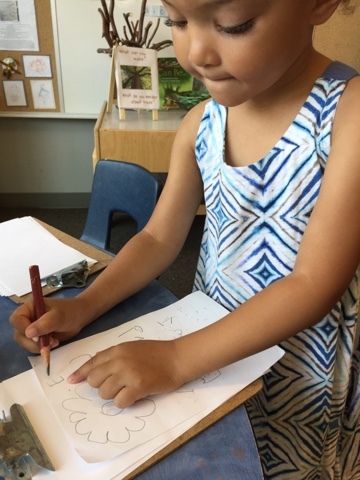 I asked them to reflect upon and share what they had experienced at the centre during playtime; I wanted them to describe what they saw, what they noticed about the flowers, what they wondered about the materials. I read the sign included in the centre "How many petals altogether?" and encouraged them to consider my question about the flowers. 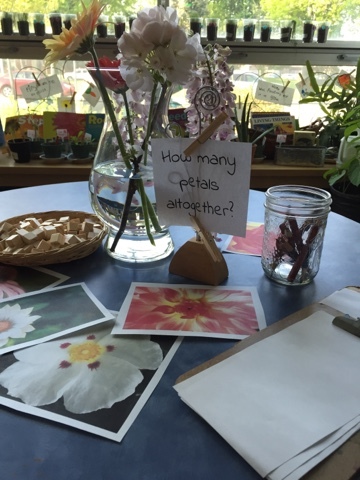 Many children were interested in the idea that we could count the number of petals and offered suggestions for how to do this. 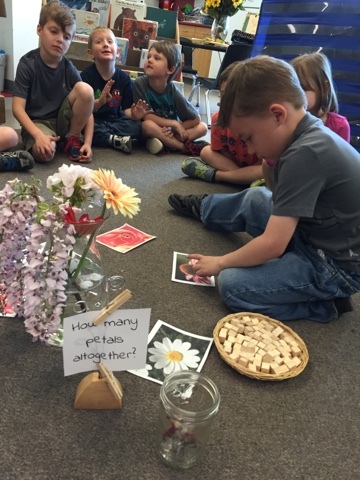 One child wanted to place one block on each petal of all the flowers and count them to get a total. 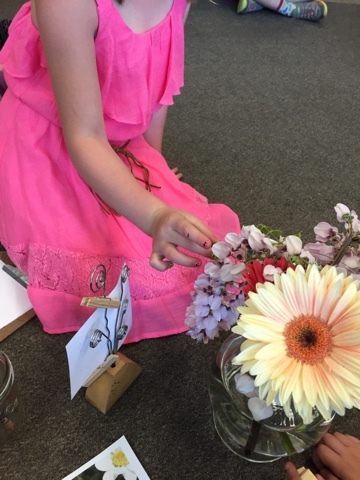 Another child thought that each flower petal should first be counted in the vase and then the same number of blocks could be represented in a collection next to it. After discussing the suggestions and ending our circle time, the children flowed back into the play activities. 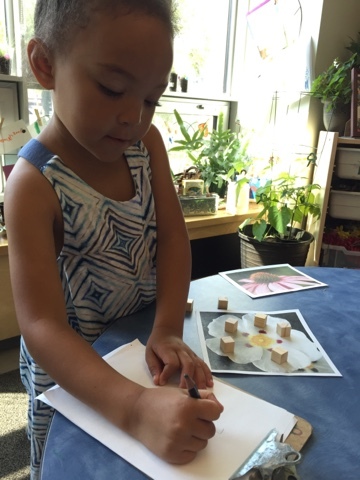 We noticed that many new children visited the flower activity and were quite eager to see if they could calculate the petals. 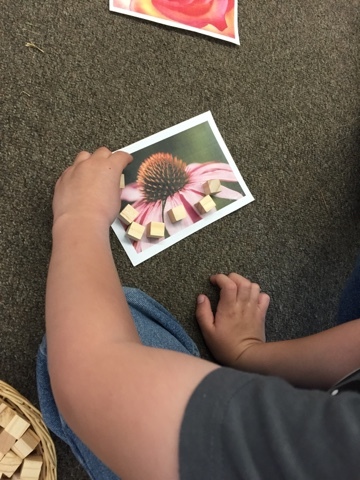 ...and some created addition sentences after putting blocks on many pictures and wanting to discover a total number of petals in all the pictures. 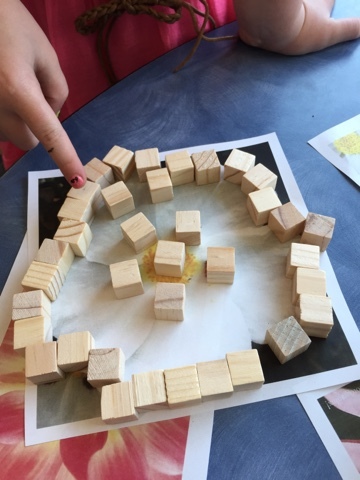 "I put one block in the middle where the pollen is. I put one block on each petal, so that's 5. Then I put blocks on the outside of the flower. I wanted to see its outline." Fascinated by her work, I continued the conversation by reminding her of our work with the tree circumferences in our current outdoor exploration. 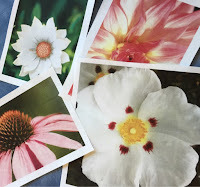 I introduced the term 'perimeter' and helped model and explain for her that we could find the perimeter of any object including the two dimensional pictures of the flowers at the centre. 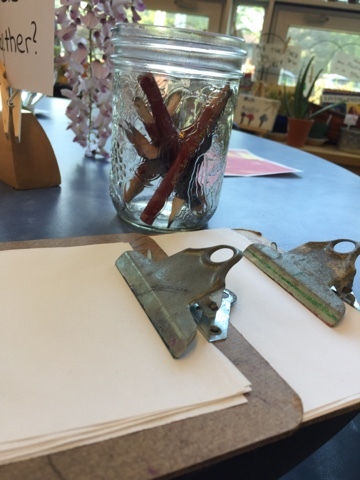 This is the sort of beautiful evolution of teacher-initiated activities that emerge when children are able to manipulate materials freely and creatively in their own time and space. 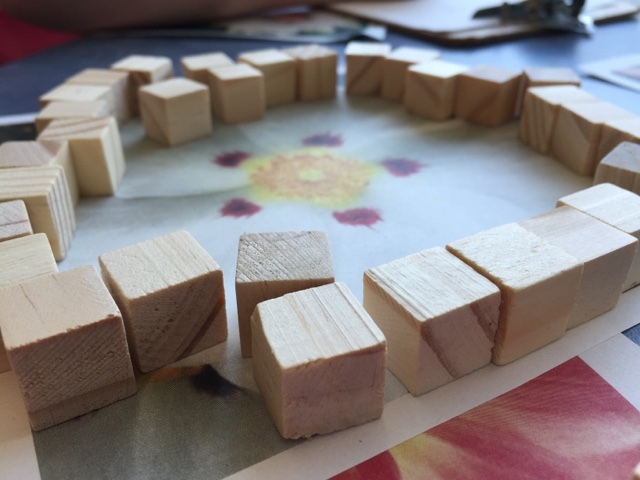 Educators who engage in playful experiences together with children can first observe, question, introduce and then scaffold more complex math concepts with those children who appear engaged and interested. Discovering the perimeter of the flowers certainly was not what I had anticipated doing with the initial flower invitation, but this is where I was led by this child. She was quite eager to record her ideas and our conversation and independently shared her math thinking in a written format. 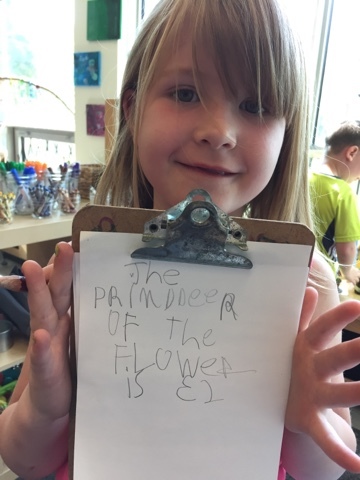 Her idea to help explain to others the meaning of perimeter included drawing a picture of the flower and then writing numbers on it to represent the number of blocks used for the outline. 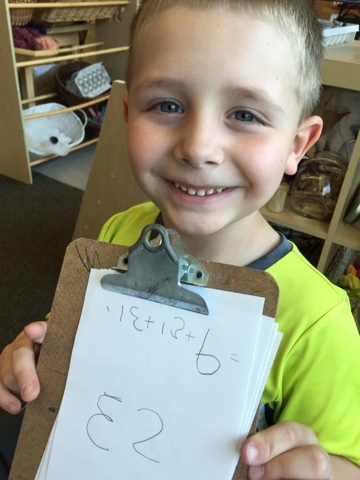 It's my hope that by sharing this example it's evident that not only is it developmentally appropriate to share teacher invitations for explorations, they can be introduced during whole group time and then rediscovered by children in new and innovative ways. Had I first introduced this math invitation at circle the children might have not been as interested, or only counted the flower petals as modeled at the circle. 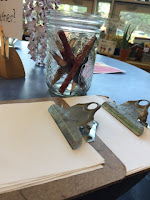 However providing open-ended time for them to discover and explore the invitation before discussing it helped bring richer background knowledge and ideas to our collective exploration. 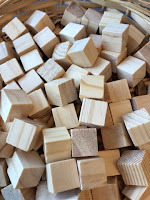 Revisiting the materials after a free and then focused time working with the pictures and manipulatives might have encouraged more children to visit the centre or think more deeply or differently about the topic. 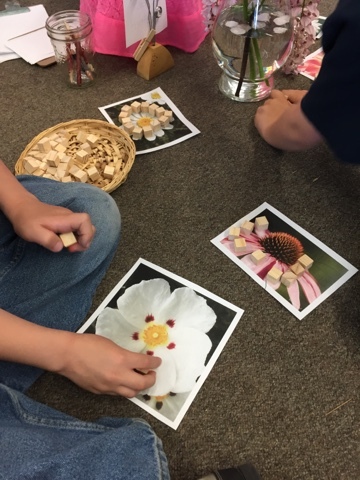 As the educator in the space I am satisfied that the idea of counting the petals using manipulatives was explicitly introduced to the whole group and that I was able to meet individual children at their interest and ability levels, especially those that wanted to represent and add multiple flowers together, or measure the perimeter. My next step for this activity will be to invite the children who visited the centre today to share their ideas (and photos of the experience) tomorrow during our consolidation and sharing circle as we ran out of time today. Perhaps this will help us introduce the idea of measuring perimeter to the whole group and encourage other children to think about measurement and the invitation in a different, more evolved way. What a wonderful learning experience, as much for you the teacher, as for the children. It is a privilege to be able to share the learning journey with young children. To inspire and guide, that's our role. It's a pleasure to see it portrayed so beautifully. We make the most of the teachable moments without making it seem, to the learners, like we are teaching, just encouraging them to extend their learning. This is a common conversation with educators and administrators and I think you have shared a beautiful example of how learning can flow from teacher provocation to student-lead inquiry. I think there is a false dichotomy at times - either explicit instruction or inquiry - when both can co-exist in the same classroom if the educators are thoughtful and reflective.